Time to time in book depositories, laundromats, and thrift shops, comics from a lost time appear. Comics from the defunct (and then revived and now agonizing) Valiant comics, that in its golden age was able to stand to Marvel and DC and commission its titles to acclaim and other video game developing houses among other amenities. that taught him the secrets of destroying machines by martial prowess so humanity had a champion the day another artificial intelligence raised with less philanthropic goals. seemingly I am not the only one who ever found these comic issues and was never able to know the full story because of their vintage nature. The comic of course feature some robot girls getting damage and disassembled time to time. I have found finally a collection of Magnus robot fighter comics and I would love to left the link here so anyone can enjoy them too. I am not sure If I am allowed sharing the link, although using the right keywords it ain't hard to find. If so I'll be sharing it once I get confirmation. 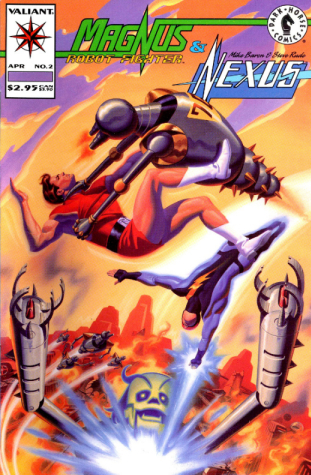 Ah, Magnus Robot Fighter. I remember some great scans used to be on the old Female Android Cornucopia. Feel free to post that link. hope this serves someone in the near future. And my condolences to the person that found this thread many years into the future when the link died, too slow bro.